Take 1 tablespoon 2 times a day with a meal for the first 2 days, gradually increasing the dose every 3 days, until the optimal dose: 1-3 tablespoons 2 times a day. The supplement contains medium-chain fatty acids in an accessible liquid form. Thanks to that they can be a great addition to protein-fat meals, serve as an addition to the bulletproof coffee, or be a base for frying dishes. Consumption of a single dose of more than 100 g, without prior adaptation, may cause gastrointestinal discomfort. Long-term consumption of high doses of MCT oil increases the need for L-carnitine. Complementation of the organism’s needs for branched-chain amino acids. Supplement connecting BCAA containing amino acids and selected the EAA. It facilitates recovery after training. Dietary supplement of simple and complex carbohydrates, enriched with vitamins and antioxidants. 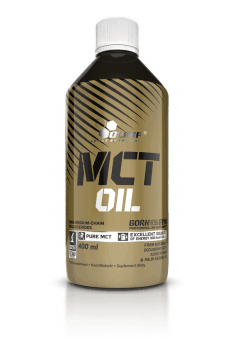 MCT (medium chain fatty acids) are a group of fatty acids called. the average carbon chain length, containing 6 - 12 carbon atoms. For MCT acids include: caproic (containing 6 carbon atoms - C6), heptanoic (C7), caprylic acid (C8), pelargonic acid (C9), capric (C10) and lauric (C12). In contrast to the long-chain acids digested by pancreatic lipase and absorbed through the portal vein to the liver transferred in the form of chylomicrons, reducing the risk of atherosclerosis. MCT is a natural source of coconut fat, less milk fat. Thanks to the properties of digestifs are a quick source of renewable energy (have the thermogenic potential). Antibacterial potency permits the use of clinical treatment (including liver diseases, malnutrition, disorders of metabolic processes). They are recommended in sports supplementation of different sports programs to reduce weight and build muscle mass, as a calorie complement of a diet and element of enhancing physical exercise capacity support element and wellness after exercise. Available at www.muscle-zone.pl.